Classic fashion with your logo. This Madrid styled straw hat comes in a beautiful golden honey colour. Its loose cross woven design gives you plenty of fresh air to keep things dry and cool. It has a full brim all the way around, giving you all around protection against the sun. The brim has a finished edge to help prevent fraying and add a little class as well. An interior sweatband helps to wick away moisture, keeping the face dry. It comes in two sizes, S/M and X/XL. If you need a uniform hat that protects your staff from the hot sun or a handsome and desirable promotional sales hat, then we will put your brand on hatbands on these stylish hats. Suitable for businesses and organisations that like the sun and prefer to look good. Great for hotels, resorts and other hospitality businesses, especially in hot and tropical areas. 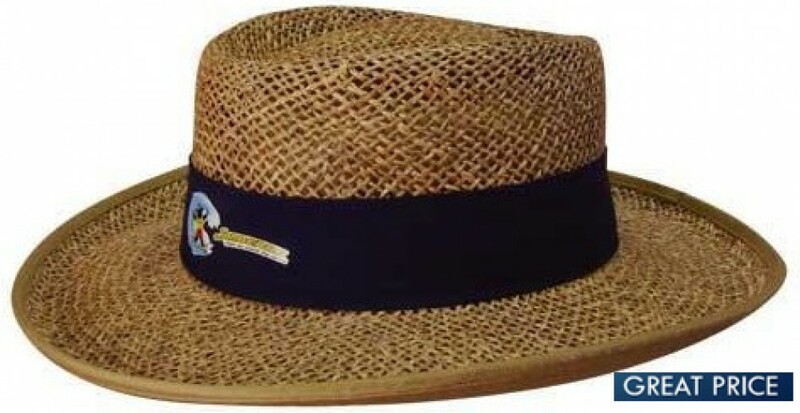 Your logo can be printed or embroidered on the optional hatband. Standard price includes embroidery of up to 8000 stitches. Ask for pricing information on other branding options. Please provide your branding artwork in eps, pdf or high-resolution jpeg format. The listed prices exclude GST and delivery costs. Ask about our digital mock-up service.